Detail of View from Mount Burdell, painting by Kathleen Lipinski, emerylipinski.com. Has anyone written a poem about bunchgrass? Or buckeyes? About the way that every year buckeye trees grow their big thin vividly green leaves first and lose them first among the deciduous trees, a water-conserving strategy and an aesthetic one; about the way leaf loss bares the delicate wavering line of their pale boughs, branches, and twigs, less gnarled and jagged than the lines of oaks; and about the elegant composition of the tree overall, standing delicate yet solid, holding not only its ground but the air around it in its gray fingers, a hemisphere of arboreal grace? If no one has yet, someone should celebrate their composite pale blossoms in the spring standing up all over the green tree like candles. “Erect panicles,” says an encyclopedia entry in a phrase whose vaguely phallic language brings us to the testicular fruit that dangles from those bare branches in pale leathery casings before they split open and the gleaming chestnuts fall to the ground. The buckeyes grow mainly along the Coast Range and the foothills of Central California, from Redding to Santa Clarita, a ring of Aesculus californica you shouldn’t take for granted. Among the things familiarity breeds, contempt is not nearly so common as an affection that sometimes slides over into obliviousness; the wonderful readily becomes wallpaper to everyday life until something changes. During a summer in Iceland a few years ago I overcame a childhood within easy reach of Muir Woods. I’d never quite gotten the point about really tall trees until I was in a country where a 30-foot-tall tree is a giant–and a rarity–and trees themselves aren’t that common. (The bad joke is that if you get lost in an Icelandic forest you should just stand up.) But the exceptional does get celebrated, even if you aren’t always wise enough–as I was not, as a child–to know that it’s exceptional. The quotidian is readily overlooked and rarely celebrated, which is why you can drive past the most exquisite and ordinary oak grassland turned over to grazing on your way to any number of protected exceptional territories, such as Yosemite National Park. That Yosemite Falls is the fifth tallest waterfall on earth and the tallest on the continent is nice, but the music of water is sweeter on a small scale, and the mesmerizing revelation of falling water can be realized by any cascade over the rocks of any stream in spring flow. In Marin County, you have praise sung and tourists dispatched to Muir Woods–the chief surviving redwood forest of note there–and the coast and Mount Tamalpais, the highest point, but most of the county that isn’t under asphalt is tree-studded grassland, green in spring, gold in summer, graying in the third season we have that hybridizes fall and fast-forwards through what isn’t quite winter until the next green pokes through the flattened dun-colored grass. Studded with oak, buckeye, and bay trees, to be exact, beautiful trees all. Mount Burdell, Novato, painting by Thomas Wood, twoodart.com. When I’d spend summers or any long stretches of time in the Southwest, coming back over Tehachapi Pass I’d see the wonderful change–you go up the desert east face of creosote bush and then sagebrush and over the crest to descend a slope of oaks and grass–and every time I saw my home biome that wave of emotion–reassurance, comfort, recognition, ease, the emotions you feel when you see the face of your friend in the crowd of strangers–would settle in. Even though I love sagebrush, desert, and mountain landscapes, this was home. So my affection for Mount Burdell partakes of these ingredients. It’s a superlative version of the most common landscape from near the Oregon border to just north of Los Angeles. There’s something about the way the mountain–for the 1,558-foot hill has been graced with this term–sits alone, sloping gently upward to its rounded dome, calm and resplendent, like a lion lying in repose not far from the northwestern shores of San Pablo Bay. It’s not a foothill or part of a ridgeline, but a distinct, discrete form visible from across the Bay and from a long way away in either direction on Highway 101, which travels below its eastern slopes. Burdell is also about a mile north of where I grew up, in what was in those days one of the northernmost subdivisions in the county. There’s a little more development between my formative split-level ranch-style bunker and the foot of the mountain now. Nevertheless, Burdell still crowns a huge swath of open space between northern Novato and the southern agricultural outskirts of Petaluma. When I was a kid it was all grazing land for the dairy farmers and some ranchers running beef cows, or I think it was in those days when private property did not concern me and my brothers. We climbed through the barbed wire with absolute confidence in our right to do so and traveled freely and frequently in a landscape full of spaciousness cows and barbed wire. On the northeast side of the mountain is Olompali State Historic Park, and the landscape there is wonderful for many reasons, not least among them the abundance of native bunchgrasses that grow along its eastern slopes, grass that once covered far more of the state and still grows here in big tufts and long plumes. Grasses don’t get enough attention either, but these cascades of blades are a nice change from the bone-dry non-natives of a California summer. This face of Burdell is in some ways a quotidian Bay Area landscape, but one that gives you a feel for what the place might have been like 200 years ago before the nonnative annual grasses overtook the bunchgrasses and the bunchgrasses mostly retreated to relatively inhospitable serpentine soils (along one of the northern arms of Tam, for example). It’s quietly lush. Olompali is notable for other reasons–it was the scene of a skirmish during the Bear Flag Revolt of 1846 that merged with the war on Mexico that turned all California and the Southwest into American territory. Before that it was where Camilo Ynitia became the only indigenous Californian to receive a Mexican land grant. In fact the place’s human history, from indigenous village to rancho to battlefield to gringo estate with exotic plantings (the palms and pomegranate hedge are still there) to abandonment to hippie commune to state park, encapsulates much of the history of California, but never mind that for the time being. The quotidian is readily overlooked and rarely celebrated. When my aunt was dying in Sonoma County a decade ago, I used to stop at Olompali for a decompressing walk on my way back from visiting her, but from late childhood until this magazine assignment I hadn’t approached the mountain from any other angle. This time I did, on a cloudy, humid late summer day. Old memories of wandering the region came back, including a summer when the grass was taller than we were, and my younger brother and I trampled a labyrinth into it with an occasional overhead arch made of shocks of grass twisted together. It was just wild oats, not the native grasses, but wild oats deserve their poets too, for the wonderful pale gold they turn, for the way the chaff hangs on the plant long after the seed has gone, light and dancing in the breeze. Is there a word for that particular color that is at once pale and golden, not as yellow as grain ripe in the field, a little tawny like lions, both stark for its utter dryness and lush for its abundance, the color of much of the landscape in summer? Should there be, and would it be a phrase like hills of August? Or just summer-colored? Lion-colored? Cougar? I entered the Mount Burdell Open Space Preserve (part of the Marin Open Space District) off Simmons Lane, heading north and west from the cul-de-sac of houses, and found a stand of wild oats that was taller than my now-much-taller self, and then a stand of artichoke thistles that must have been eight feet tall. There must have been a tiny miracle in the hydrology or soil of that corner of the preserve. The weeds were this year’s crop, but the trees farther up the trail must have changed little in the 40 years in which I’d changed so much. Wordsworth wrote, “But there’s a tree, of many, one/A single field which I have looked upon/Both of them speak of something that is gone. . . .” But the visionary gleam returns, unexpectedly, as though that familiar face you strained to see in the crowd came suddenly knocking at your door when you least expected. This, this feeling where recognition mounts into revelation, is a friend who is not reliable, but who nevertheless shows up. There is something ordinarily marvelous about the way that some oak trees grow into hemispheres of foliage, their lowest branches trailing along the ground or elbowing into it, the way they create a shady room within, the way that the larger oaks resemble old men with their gnarled angular limbs and their sense of survivorship. That they’d sat still while I’d grown up and gone away and had various crises and revelations and 90-degree turns and ruptures and advancements, that I might’ve walked by them in 1970 and here they were again, hardly changed, was sublime and a little mortifying. Trees remind us how busy and unstable we are, and how ridiculous that is. And those domes of trees and the bare trees whose branches nevertheless carve out a rough hemisphere of space must be, after cumulus clouds, one of the greatest articulators or celebrants of what three dimensions really mean–reaching in every direction, carving out volumes from the air. After clouds and trees, swallows might be best at this job when they swing and plunge through the afternoon air as they did late in my walk. Most of our pleasures–the personal ones of love and friendship, the animal embodiment of everyday activities like walking, the impersonal visual and spatial splendors of form, of scale, of color, and texture–are utterly ordinary, except when they’re not available at all. 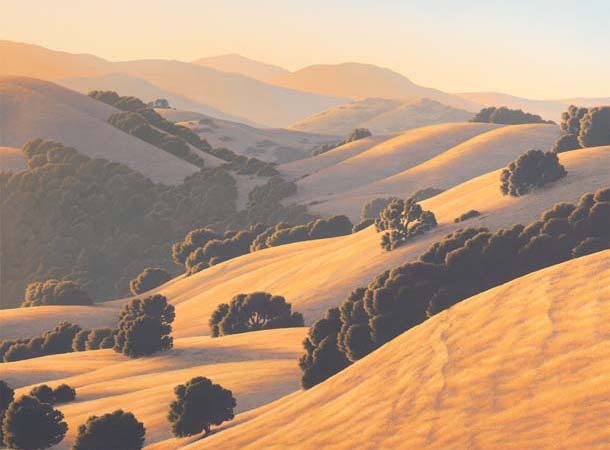 Summer Shadows, Mount Burdell, painting by Christopher Newhard, baywoodartists.com. Memories returned as I progressed–there were springs, I recalled, and then I saw springs, now fed into big rectangular troughs; and then there was the trail to the quarry that my brother Steve was intrigued by 40 years ago, when the quarry was still an open pit; at the crest there was the old wall of stones that I somehow recalled was Chinese-built. Though it’s only 1,588 feet, the summit feels remote, and the hot air became cool and breezy, the stones rougher, the lichens thicker, the trees smaller–there’s a dwarf oak forest up there–and suddenly I could see over the mountain to Sonoma County. A mountain is usually described as a form, but it can also be described as a series of viewpoints, and to walk a mountain is to have vistas appear and vanish, the landscape close around you so that you see only the near and then the far shows up around the bend; to see more and more of the world as you rise and as much as possible at the summit, if you’re not surrounded by fog, clouds, weather, trees, or inattention. A less chartable series of subjective viewpoints also flows as you walk: you look at the world around you, you are lost in thought and hardly notice anything until a quail bursts from underfoot or the crack of a stick startles you, you travel back in time and then an intensity of color or the joys of the lines of a madrone bring you into absolute present. I had walked for about three hours, I had traveled 40 years back to my childhood, or traveled hundreds to the origin of the trees, or thousands with the stones; I had thought about much that was absent and some that was present, had seen boughs and clouds and mourning doves and, at the very end of my six or seven miles, three western bluebirds that were surely the bluebirds of happiness. By that time I had gotten just lost enough to have to wake up fully and pay attention to the lay of the land, to cut cross-country to the path whose juncture I had not noticed and find my way back to the suburban cul-de-sac. Nothing and everything had happened; I had walked a few miles, and those miles had been far enough to travel to the distant past and to forgotten and faintly remembered scenes; I had seen the blue of sky, of distant hills, of bluebellies, and bluebirds and one scolding jay. That was more than enough. San Francisco writer, journalist, historian, and activist Rebecca Solnit is the author of 13 books about art, landscape, community, ecology, politics, hope, and memory. Her new book, Infinite City: A San Francisco Atlas (UC Press, 2010), is a genre-bending collaboration with 27 artists, writers, and cartographers, consisting of 22 colorful maps and 19 essays. A Bay Area native and the product of the California public education system from kindergarten to graduate school, Solnit is currently a contributing editor at Harper's and a frequent contributor to Tomdispatch.com.